Bakwan Jagung Recipe. Easy recipe, simple side dish and tastes really good. 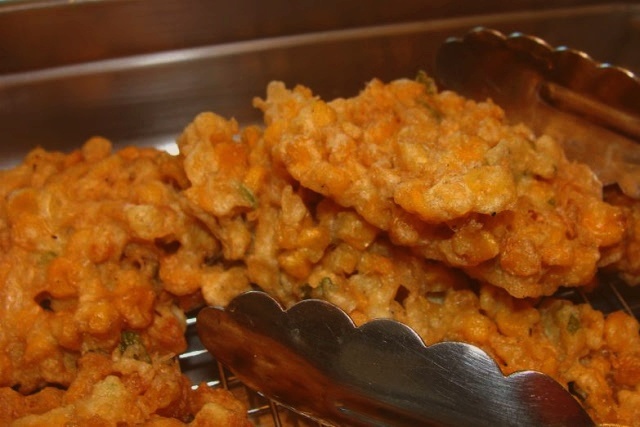 Bakwan Jagung or Deep Fried Corn Fritters, are normally being sold from carts on street corners in Indonesia. Bakwan Jagung can be eaten on its own or dip it with chili sauce. Enjoy Bakwan Jagung as a snack! Mix all ingredients in a bowl and make a dough ( good mixing : not too thick and not to liquid/fluid ). Heat the oil in deep wok and and fry 1 tablespoon of mixture until golden brown. Serve with chili sauce and chopped coriander leaves on the top. u can also add rice flour to get the bakwan more crispy. i would use fresh corn lah. This is just such a mouth watering site with lots of delicious recipes. I feel hungry already.I like it a lot. I’ll be back soon for another look. yes, you can use rice flour about 1/3 and 2/3 plain flour. you have the knowledge, skills, its your appetite. this recipe is a guide. tx for the comments. I never had these but I really like what they look like! Yummy!